Synopsis: She took down the world's most dangerous man. She made one mistake; she let him live. 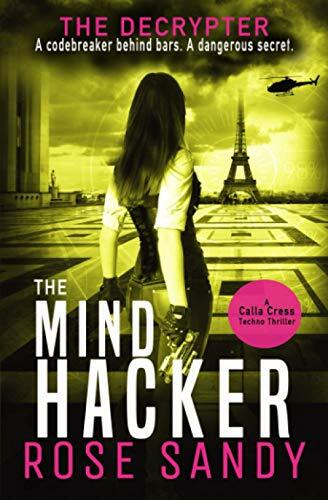 Calla Cress, museum curator, turned undercover cyber-security agent, is harboring a dangerous secret buried in the deepest vaults of technology history. In a few hours, she'll have to make a decision that will change her life forever. A billionaire behind bars, once the secret service's most brilliant code breaker, is luring the world's smartest minds into his prison cell. They leave in a coma and seconds later a lethal hack snakes through one government system after another. When an explosion rocks Calla’s hideout in Colorado, she wakes up halfway across the world at the whim of a powerful, unidentified organization demanding she produces the whereabouts of a missing MI6 agent who can disarm the billionaire's hacks. Powerful people are prepared to kill to obtain the cryptic secret the agent hid. There're a few obstacles: Calla has never met the agent who has been missing for twenty-eight years. Can Calla find the only person who ever challenged the enigmatic billionaire? With only a handful of clues left in a mysterious sixteenth-century anagram, Calla, NSA security advisor, Nash Shields and tech entrepreneur Jack Kleve are thrust in a dangerous race across the globe. With each haunting revelation, they soon realize the key to disarming the hacks comes at an astonishing price. THE DECRYPTER AND THE MIND HACKER is a fast-paced, suspense thriller, charging through government secrets, world history and cyber espionage that will have you wondering whether technology has progressed beyond human intelligence, changing civilization, and perhaps human nature. Reader Praise for 'The Decrypter: Secret of the Lost Manuscript' "Takes you on a ride and refuses to let you off until you reach the very end." "A brilliant read! I recommend this to anyone who enjoys mystery, suspense, thrillers or action novels. The detail is astounding! The historic references, location descriptions, references to technology, cryptography....this author really knows her stuff." "An action-packed adventure, techno thriller across several continents like a Jason Bourne or James Bond movie, but with an actual storyline!" "Brilliantly written. I loved the very descriptive side, which was a good way of visualizing and getting to terms with each new place, as the action takes place in several different countries."